With the legalization of cannabis and cannabis-derived compounds around the world the marijuana industry is blossoming into a broad and multi-faceted industry. What was once a largely plant-based industry, including flowers for vaporizing, oils for eating and hemp fibers for manufacturing. With the rise in medical prominence of cannabinoids and other non-psychoactive marijuana derivatives the acronym field is getting quite cluttered. CBD, CBG, THC, CBC, CBN, what does it all mean? What’s the difference? What are the best applications for each? How are they used? We break down each acronym into a simple to understand definition and compare and contrast them by the end of this article you can confidently claim to be “king of cannabis acronyms”. What Are The Effects of CBG? What Are The Effects of CBN? CBD stands for cannabidoil. This is a combination of the words “cannabis” and “oil” as CBD is simply the natural oil extracted from marijuana plants. Unlike THC (tetrahydrocannabinol) cannabidoil has no medically documented psychoactive effect on the user. Cannabidoil (CBD) is just one of 113 different cannabinoids that can be extracted from marijuana plants. The most common reported effects and uses of CBD, either orally or inhaled, include reduction of stress, pain management and even treatment for epilepsy. Although originally discovered in the 1940s, well documented medical research is extremely limited with most studies concluding a definite impact on the brain but are still lacking in terms of specific observable outcomes and prescribed treatments. Does it get you high? No. Since most laws regulating or prohibiting cannabis are directly tied to THC many states have no laws on the books for CBD specifically as it is low in THC or has zero THC (depending on extraction process). Specifically, as long as the THC content is less than .3% then any cannabis derived product can legally be classified as “hemp” or “hemp oil” and thus legally manufactured and sold. Still, as with medical and recreational marijuana use, there is often conflicts between local state laws and federal laws. The Drug Enforcement Agency separates legitimate hemp production as defined in the Agricultural Act of 2014 and CBD sales. The DEA claims the Agricultural Act of 2014, also known as the “Farm Bill” only allots for CBD research and not manufacturing and marketing directly to consumers. Still, lack of federal prosecution and the exploding popularity of CBD means it is much more likely to be legalized than it is to be criminalized. Like CBC, CBG or “cannabigerol” is a non-psychoactive hemp extract containing less than 1% THC, making it generally well accepted for therapeutic applications. CBG is actually considered to to be the “mother cannabinoid” as both THC and CBC are derived from this compound. Specific enzymes in the cannabis plant break CBGA (cannabigerolic acid) into both tetrahydrocannabinolic acid (THC producer), cannabidiolic acid (CBD producer) and cannabichromenic acid (CBC producer). Still, this doesn’t make CBG psychoactive as the acid requires ultraviolet light (which plants receive naturally from the sun) to break these acids down into their more recognizable THC and CBC forms. As with most non-THC related cannabinoids research is ongoing involving this “mother cannabinoid” and it’s potential therapeutic and medical applications. CBG, as long as it is not produced from the flower (bud) of the plant is legal in the United States under the Agricultural Act of 2014 which protects hemp production and hemp-based products, of which CBG belongs. CBC is short for Cannabichromene which is lesser known chemical naturally found in cannabis plants. Similar to CBD it is one of the 113 cannabinoids found in the plant and extracted for therapeutic uses. Cannabichromene is a phytocannabinoid with a chemcial composition similar to tetrahydrocannabinol, tetrahydrocannabivarin, cannabidiol (CBD) and cannabinol. This compound was discovered in 1966 making it a relatively recent chemical. Few studies have been done on CBC. A 2010 study found that CBC along with cannabidiol and tetrahydrocannabinol have antidepressant effects as well as neurogenesis properties. Few studies with CBC in isolation have been conducted. 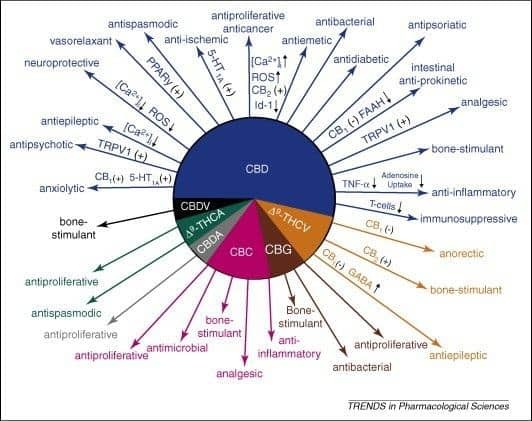 In mice one of the most pronounced effects are anti-inflammatory properties, however this was done with the presence of THC, which is usually removed for OTC CBC oils, so whether the anti-inflammatory effects were directly a result of the CBC or synergistic function between CBC and THC have yet to be determined. Even “popular” chemicals like CBD fall into legal gray areas between state and federal law there is even less of a precedent for more rare compounds like CBC. Still, as long as THC content is below .3% the oil should be technically legal with protection found under the same Agricultural Act of 2014 (Farm Bill) that protects other industrial hemp derivatives. Cannabinol is one of the more popular yet rarer non-psychoactive compounds found naturally occurring in cannabis plants. CBN itself is a metabolite, or byproduct of tetrahydrocannabinol (THC) synthesis. CBN is most common in aged cannabis plant material such as highly oxidized hemp products, low-quality farmed cannabis and non-chemically produced hashish. Unlike the other cannabinoids mentioned in this article CBN itself does not come from the CBG mother chemical. It is instead a degraded byproduct of tetrahydrocannabinolic acid (THCA). This happens when cannabis plants are exposed to sunlight over an extended period of time to the point where the THCA converts into CBNA (cannabinolic acid). CBN is simply a decarboxylation (release of carbon dioxide from plant) of CBNA. As with other cannabinoids CBN is legally protected as it does not contain THC, it is simply a THC byproduct. It is commonly found in agricultural circles where high volumes of natural hemp plants are exposed to oxygen and ultraviolet light which work to create CBN out of THCA. Tetrahydrocannabinol is the mac-daddy that is the phsychoactive component of cannabis that causes users to feel “high” when consumed. THC is the chemical that also determines whether a hemp product is legal or illegal depending on whether or not it is present in quantities of over .3%. THC exists in the cannabis plant as a lipid that is active in the plants natural defense against insects, animals, harmful ultraviolet light and other natural stressors. This compound is found in varying quantities in medical and recreational marijuana and in very very low quantities in agricultural cannabis. Thus, if seeking the benefits of THC most American citizens will need to live in a state where marijuana has been legalized as THC itself is still technically illegal at the federal level and does not enjoy protection under the Agricultural Act of 2014. THC is legal in all states where medical marijuana use has been legalized. It is also by default legal in states where recreational marijuana laws have been passed. It is still technically illegal at the federal level however prosecution has been almost non-extent in the 31 states that have legalized medical or recreational marijuana. Many of the cannabinoids are only now being studied in controlled laboratories and so their complete spectrum of benefits are not yet fully understood. Much of this is because of archaic marijuana prohibition laws that made research costly and slow. Now however with the growing popularity of legal cannabis and the de-criminalization of this miracle plant there are more and more researches receiving funding to study the long term effects of CBC, CBG, CBN, CBD and THC itself. We will continue to update this resource as new studies are completed and more knowledge is published on medical and chemical impacts of these truly unique chemical compounds.